People-Powered, data driven marketing analysis & insights that makes your programs and teams, internal & external, more effective. Prove and improve marketing ROI. Information will help deliver insights into health and success of our marketing programs. Manual data pulls with few automated APIs to ensure speed and accuracy. Stuck with surface level insights, unable to answer meaningful questions on-demand. Tremendous time, energy and effort to produce. Little or no time for insights. What is my return on marketing investment? Forecasted revenue from marketing activity? How is marketing affecting funnel quality & velocity? What should I spend on marketing to drive quality leads (cost/p): C/MQL, C/SQL, C/Closed Won. 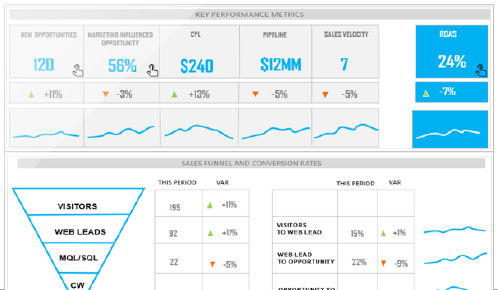 Attribution: What campaigns, channels, and content are driving qualified leads and sales? Who are my best prospects? What resonates and how do I attract more? Why do our best prospects engage with us? The nerds who know how to move and connect large sets of disparate structured and unstructured data. Nerds, real data nerds. Use math and statistics unlocking data drive insights. Experts who know how to work on and within your tech stack. Digital marketing experts, unlocking insights and developing ideas to improve performance. 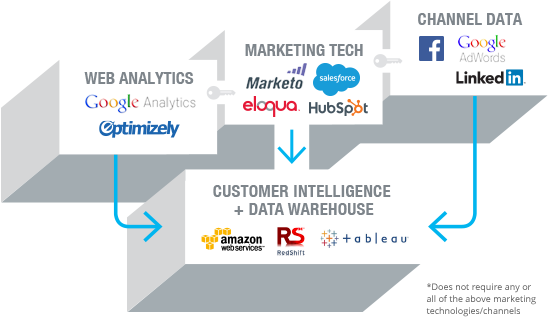 Out team will audit your marketing tech (web, analytics, & ad) to understand the current state of your data maturity. Provision your instance of Data Torch, our marketing analyst platform. Cleanse, map, de-dupe and scrub data for accuracy. Onboard your data via API and flat file imports. 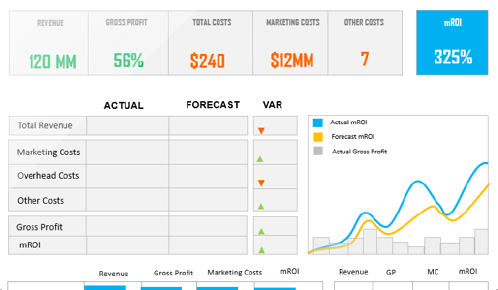 Exec + mROI Dashboard CRM & Funnel Media. Channel & ROAS Customer Engagement. Recommend marketing choices and decisions. Leverage experienced data analysts, digital strategists and experts. Review insights and recommendations via monthly. We use market driven software to enable greater analysis & insights, with less time and no additional license costs. The manifestation of solving the same problem, literally hundreds of times over for our customers one off enables resource strapped marketing departments access to a set of best of breed technologies that powers deep analysis and insights. Dashboards summarize complex information and present it in an easily digestible way for executives to assess how the business is performing. What portion of the new opportunities were marketing influenced? How healthy is the Sales pipeline amount for this period? How many NEW Opportunities have we captured excluding recurring renewals? What is the Return On Investment for this Fiscal Year? How healthy is the sales and marketing funnel compared to last year? How many Close Won Opportunities did we get this month? Fewer than 20 percent of B2B organizations are comfortable with their ability to quantify the returns on marketing spend. The dashboard allows for marketing organizations to set up their marketing goals and spend that align with corporate objectives. What was the marketing ROI generated last month? Forecast: How close am I to achieve my revenue target by the end of the quarter? As marketing budgets continue to expand, it's increasingly critical to understand how marketing efforts impact pipeline. Traditional ROI models are problematic in B2B sales cycles which tend to be longer and more complex. The most innovative marketers are using campaign influence or sales influence to measure what works and what doesn’t. How many Opportunities were influenced by marketing? How many qualified Leads and Contacts Per Opportunity? How many touch-points per Opportunity? This is the only view that accounts for lead creation and conversion to opportunities from a dynamic and static perspective, allowing us to answer distinct business questions related to performance. 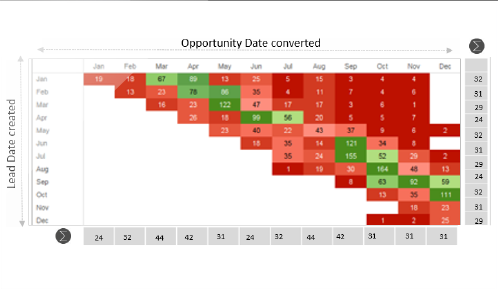 What is the average number of months for a lead to convert into an opportunity? When did marketing drive the highest quality leads to the pipeline? Were there any specific tactics that caused higher conversion rates per month after lead creation? How efficient is the sales team at converting opportunities into sales? 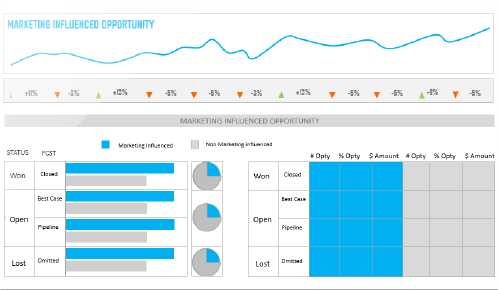 This dashboard gives you the ability to identify trends and drill down to specific periods of interest. How are the key metrics trending over time? What is the Year to Date growth for “x” metric? What is the Month over Month growth or decline? What is the Year over Year growth or decline? Measuring Marketing is a challenging task. It requires specialized tools and highly technical teams. Although SaaS marketing technology has enabled rapid access to all sorts of data, it is very hard to understand what the data is telling us. Most agencies are not generally staffed to meet this need. 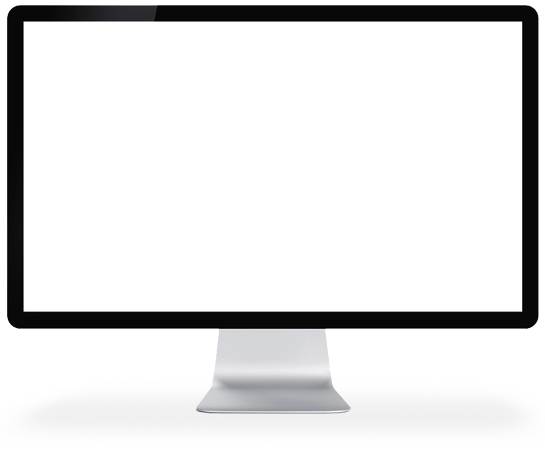 Advertising Agencies generally focus on visual design, advertising or other less technical areas. Media and Search agencies, while relatively technical compared to Ad Agencies, rarely have the level of engineering and analyst talent needed to measure marketing effectively. How do you prove marketing is responsible for sales? For most businesses that deal with 1:1 selling through a sales force (B2B and large ticket purchases), marketing activity and sales activity can be connected via lead records in CRM. In the case of consumer mass marketing (i.e. retail or dealer sales), statistical inference is typically used to determine the correlation between marketing activity and sales activity. Organizations and business models vary widely, so our ability to determine your ROI is dependent on the quality and availability of your sales and marketing data. Can you work with an existing agency / vendor / partner and with our legacy software? Yes. We are designed to work seamlessly across your network of software and agency partners. We are focused on measurement and aren’t looking to step on anyone’s toes or steal their business. We have developed our solution to meet the needs of the broadest set of marketers using the latest SAAS marketing tools. However we have developed file-based support for legacy or custom systems. Typically we will ask your team to share a file, inclusive of any internal business logic, for import into our system. If that won’t work, there are custom solution options available, although typically at much higher costs than our standard option. How is this different from my enterprise software vendor? We don’t try to replace or reinvent what those products do. They all do an important job and they all capture some element of the customer journey. But to really understand what’s going on, you need to aggregate data from all sorts of systems, and somehow make sense of it. That means logging into multiple systems, merging and cleaning up data – it is a complex and time-consuming process with relatively low business value. 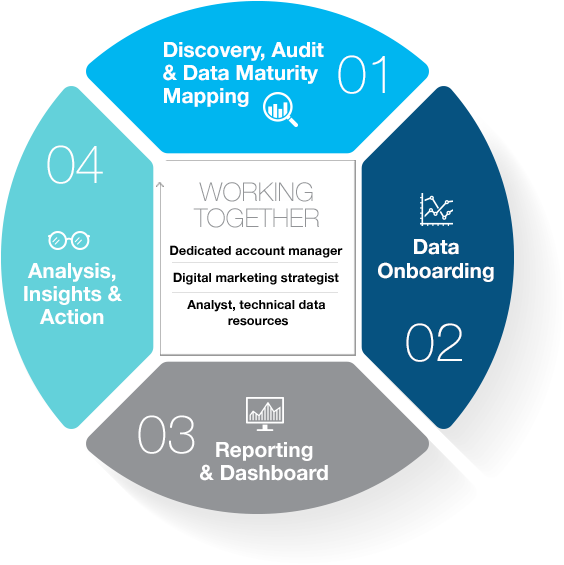 We simplify this process so your team can focus on taking action on the insights. Additionally, we’re a real team of pros who takes the time to learn your business and understand your data. When you have a question, you can call a real live person – not a chat bot or a support forum. Oh and we’re pretty fun people! yes Interested in a Data Diagnostic What is a data diagnostic? Data Weld is born from BusinessOnline, an award winning performance driven digital marketing agency. BMA Agency of the year 2015, B2B Magazine Interactive Agency of the year, Fortune top 10 (#4) advertising and tech companies to work for.